The company that bought the former Tyson Foods plant in northwest Iowa will open for business later this month. Iowa Food Group will purchase, further process, and package beef, pork, and chicken at the plant in Cherokee. The products will be sold to grocery store and restaurants. Bill Anderson, with Cherokee Area Economic Development, says the company received around 400 job applications. “We have a number of folks, hundreds of people, who leave Cherokee County every day to go to work outside of the county, so I think for citizens of Cherokee County this is an opportunity to find employment closer to home,” Anderson said. Tyson Foods shut down the Cherokee facility in 2014. Mack Zimmerman, with Iowa Food Group, says his company will maintain a relationship with Tyson. “We’ll be a customer of theirs, which is a win-win,” Zimmerman said. Tyson employed around 450 people in Cherokee before it closed. Zimmerman said he was confident there would be plenty of interest in the jobs offered by Iowa Food Group. “Especially those who had experience at the plant before and what-not…in that regard, we didn’t have a lot of concern that we’d have good employees,” Zimmerman said. 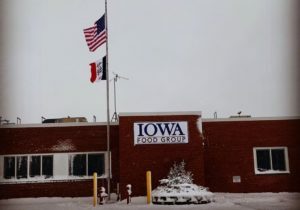 Iowa Food Group has already hired staff for its front office and sales. The company aims to start off with 100 employees and eventually grow to over 400.